Very early this morning we had a new addition to the family. Well, we couldn't allow the Doyles to get all the glory, could we? Margaret Aurelia Shaw was born at home, was 8lb, and is having a very peaceful time today with her mother and whole family. 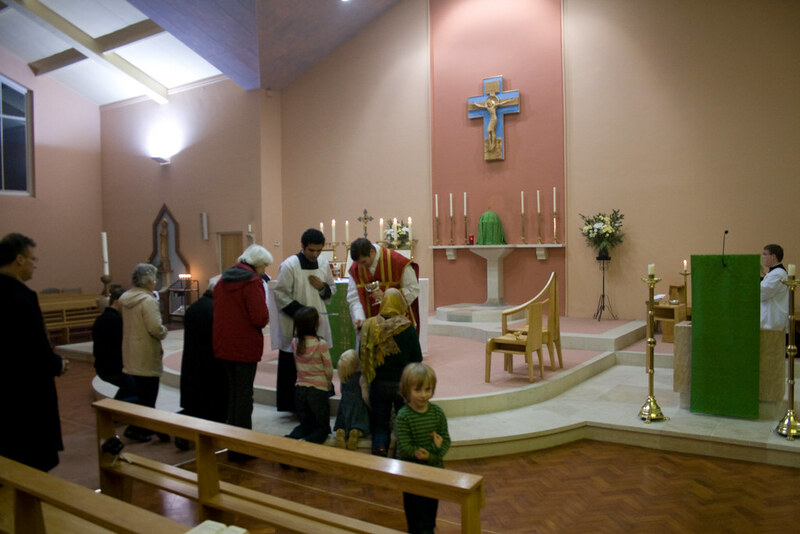 On Thursday we celebrated the Feast of St Agnes in the church of St Anthony of Padua in Headington. This is the second Traditional Sung Mass we have had there; Fr Aldo Tapparo has also said Low Mass at Christmas there (the second, dawn, Mass of Christmas). Introit and Kyrie, sung by the Schola Abelis. I founded the Schola Abelis, which accompanied this Mass, in part to bring the usus antiquior of the Roman Rite to parish churches where it would not otherwise be seen, especially in a Sung form. This term we are doing exactly that, both in St Anthony's and, on Feb 17th, in Our Lady of Light, Long Crendon. Two years ago we accompanied the first (of many) Sung Masses at St Birinus in Dorchester (and here); I hope that the Traditional Mass will become as established in St Anthony's as it has there. It is hard to know what effect one-off Masses have on parishoners; generally speaking they do not attract a large turn-out. It is something for the Traditional Mass to appear in the parish newsletter: it demonstrates that it is not something completely unthinkable. 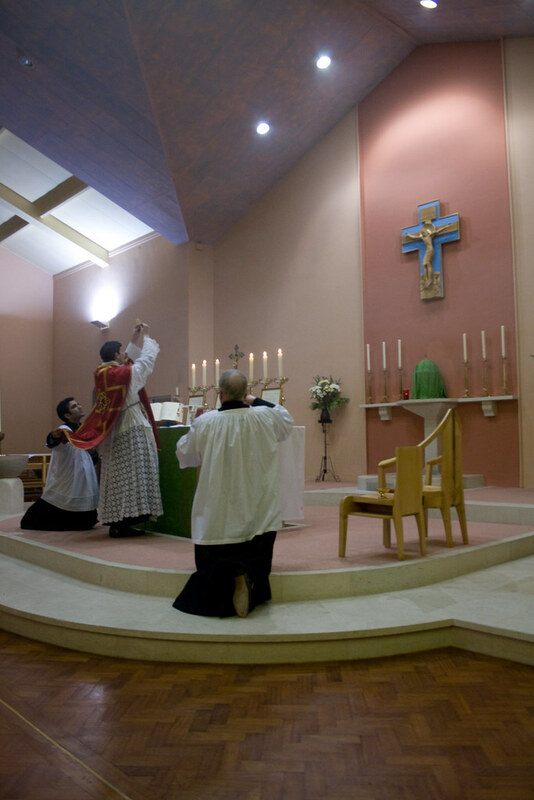 For those who do attend the Mass, they see it in what for most people is its most attractive, sung form, and this experience may influence thinking in the parish more strongly than one could guess. 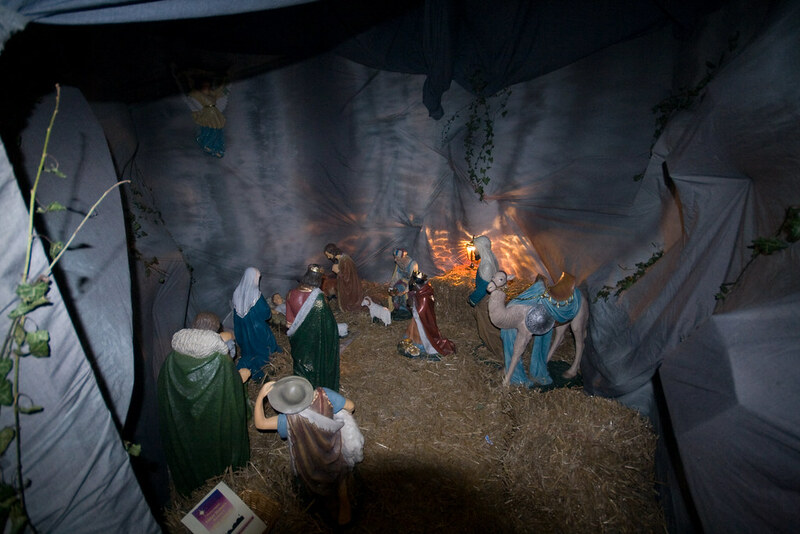 St Anthony's has a very impressive crib scene, which you actually walk into. In accordance with tradition it stays up until Candlemas. For more photos see here; for videos see the Schola's blog. I differ from many people of views similar to my own in having a subscription to the Bitter Pill, and even deriving some enjoyment from it. This letter really brightened up my day. So many of the wonderful and Spirit-filled paths that the Church has taken since Vatican II are one by one being closed, and the tragedy is that the feelings, needs and thoughts of most of us seem to count for nothing. It will be gone soon and so much of the good will be undone, but I am glad I lived and exercised my ministry in the hopeful, forward-looking and renewed Church that followed the Council. At least we were able to catch a glimpse of what Church really meant before the remoteness, hardness and lack of human warmth returned. It is not, of course, that I want to see the Holy Spirit depart from the Church and all the rest of it, but we can all recognise the code-words in this letter. The 'spirit-filled paths' of Vatican II: that'll be polyester vestments in rainbow colours. The 'feelings, needs and thoughts of most of us' will be the liberal cabal which has wielded power ruthlessly for forty years, to ridicule and trample the beliefs and devotions of ordinary Catholics. The 'hopeful, forward-looking and renewed Church' is the one which emptied the seminaries, wrecked or closed our most beautiful churches, and collaborated with the culture of death. The 'remoteness, hardness and lack of human warmth' will be coming from the persecuted minority of conservative priests who wish to give their flocks something more substantial than a reheated Guardian editorial for their spiritual nourishment - yep, these priests are gaining in numbers and influence. I am so happy to be living in a time when the 'good' done since the Council, as conceived by the average Tablet reader, is being 'undone'. Having 'glimpsed' 'what Church really meant' it is with profound thanksgiving we are saying goodbye to it. The LMS mailing was simply to tell members about our local events, which are very numerous this quarter, as I've already noted on this blog. 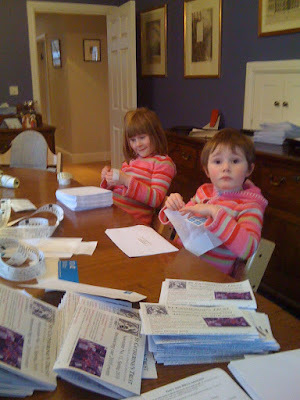 The St Catherine's Trust mailing was particularly complicated this time because we are advertising not only the long-standing Family Retreat and Summer School, but a Chant Course (we had the first one last year) and, for the first time, a Latin Course. 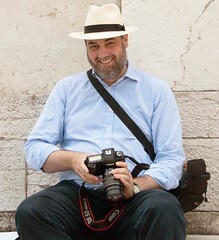 Mr Philip Goddard, a Latinist well known to LMS members, will be the director of a week-long Latin Course, running in parallel with the Summer School, 1st-8th August, at Ardingly College, Haywards Heath, Sussex. Who wants to learn or improve their Latin? Well, anyone who wants to dig a little deeper into the Catholic Tradition. Even a limited knowledge of Latin makes it possible to follow the liturgy, and understand some of the poetic force of the prayers of the Mass, which is never completely conveyed by a translation, and this degree of knowledge is not beyond anyone. For the more adventurous a fluency in Latin puts one on proper speaking terms with the Tradition, opening the door to its riches. Both for those who know no Latin, and for those who know some, this course is for you. offerimus praeclarae majestati tuae de tuis donis ac datis hostiam puram, hostiam sanctam, hostiam immaculatam, Panem sanctum vitae aeternae, et Calicem salutis perpetuae. You don't have to be an Olympic Latinist to get the gist - knowing that 'hostia' means '(sacrificial) victim' will help (not, as ICEL translated it, 'sacrifice'); some people will recognise that from the hymns they sing at Benediction. Knowing that the '-imus' ending on a verb indicates 'we' are doing whatever it is - obviously offering something, in this case - is another clue. But with a couple of school-boy memories like that you can see the beauty of the phrasing even if you can't translate every word. This, an extract from the Roman Canon, is a staggeringly beautiful piece of prose which has got to seen in the original Latin - but don't panic, this is not Ugaritic! Practically all the words have English descendents, the grammar couldn't be simpler. Isn't it just singing to you? Come on, you know you want to learn a bit more! More information is available from the St Catherine's Trust website. 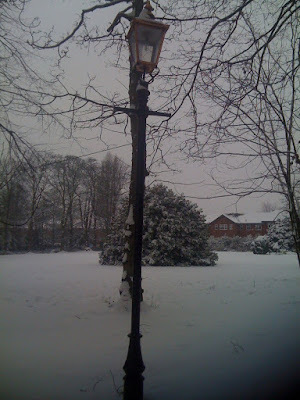 I'm just back from a trip to a very snowy Maryvale Institute in Birmingham, where I attended an Exam Board as an External Examiner for their degree in Philosophy and the Catholic Tradition, which is validated by the Open University. 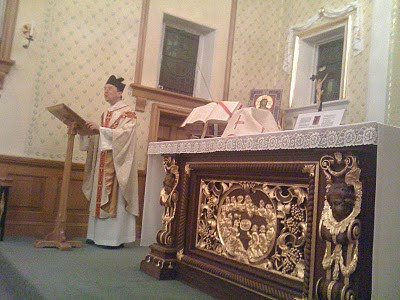 While I was there, Fr Michael Cullinan said a Traditional Low Mass in the chapel, which I was privileged to serve. 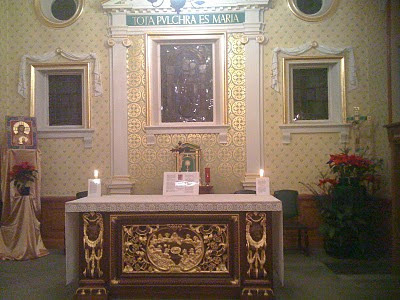 This chapel, and the altar where Fr Cullinan said Mass, was the first place J.H. Newman said Mass on returning to England, after being ordained in Rome. Fr Cullinan gave a talk at the LMS Priest Training Conference in London Colney. As well as serving the Traditional Mass community in St James' Spanish Place, he is the Director of Theology at Maryvale. This is my second year as an External Examiner for Maryvale, and I enjoy my visits very much, both for the interest of the work and the good company of the staff and the delightful Bridgettine Sisters who look after the place. Maryvale provides a in valuable and unique service with its distance-learning courses in teacher training, Theology and Philosophy, which are taken by students all over the UK, Ireland, and even Africa. Many of the students are priests and seminarians; many others are teachers in Catholic schools. For most of these students, a distance learning course is the only option, and Maryvale now has considerable expertise in providing such courses, which are validated by a number of external institutions. May Maryvale continue to flourish! I have some important local events to announce. For the full Mass listings see here. First and foremost, our new Archbishop, Bernard Longley, has agreed to participate in the annual LMS Oxford Pilgrimage. He will bless a new plaque in honour of Bl George Napier, which Oxford City Council are installing in the newly revamped Castle complex, marking the spot where he died on the Castle gallows in November 1610. The pilgrimage will take place on 23rd October, close to Bl George Napier's fourth Centenary; it will start with a Solemn Mass at Blackfriars, with Archbishop Longley in choir, after which our Archbishop will lead a procession to the site of the martydom. Other events, in chronological order. For the second time, there will a Sung Mass in this church thanks to the hospitality of Fr Aldo Tapparo. 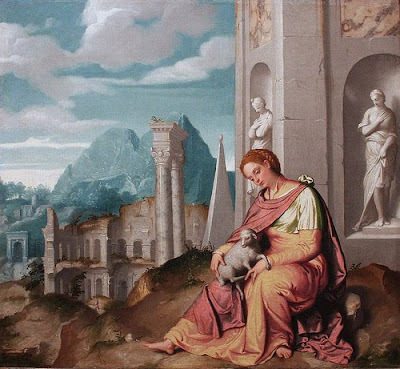 It is the Feast of St Agnes and will include chant and polyphony provided by the Schola Abelis. As has become the pattern there will be a Sung Mass for this important feast: once of the key dates of the Catholic calendar. For the first time there will be a Sung Mass in Our Lady of Light, which is over the diocesan boundary in the diocese of Northhampton. This is the home parish of Bl Thomas Belson, in whose honour the parish priest, Fr Eric Manley-Harris, has recently established a side chapel. The Schola Abelis will be singing Chant and Polyphony at a Votive Mass of the Martyrs of England and Wales in honour of Bl Thomas Belson. For the first time there will be a Sung Mass on this important feast. For the first time there will be a LMS Pilgrimage to the Shrine of Our Lady of Caversham, which is at the southern tip of the Archdiocese of Birmingham, just outside Reading. It is the Ember Saturday of Lent, and it will be accompanied by the Schola Abelis. The Schola Abelis will again accompany the Newman Mass, which will take place in the Oxford Oratory. The Mass is being sponsored by the Latin Mass Society. This is the principal patronal feast of the parish church of SS Gregory & Augustine, and it will be marked by a Traditional Sung Mass in the evening, accompanied by the Schola Abelis. I've installed a new widget for the comments. It is supposed to enable all sorts of exciting things, but annoyingly it doesn't display the blogger profile images unless you log in. We can see how it works in other ways. You'll be able to comment on a specific comment, for example, and get email updates if you want to see what other people have said after you've left a comment. I am currently preparing for the first ever (as far as I know) meeting of Directors of Chant Scholas associated with the Latin Mass Society. We will be joined by a number of people keen to promote Gregorian Chant in either 'form' of the Roman Rite, including members of the Schola Gregoriana of Cambridge and the Association for the Latin Liturgy. We will be addressed by Colin Mawby, the well-known former Director of Music at Westminster Cathedral, organist and composer. The Latin Mass Society has the promotion of Chant as one of its charitable 'objects', and we are hoping to do more in this direction. I have already learnt a great deal about the current situation, since participating scholas have kindly filled in a short questionnaire. I have focused attention on non-professional groups singing at the Traditional Mass, as of particular interest to the LMS. The first question one may ask is, where are these scholas now? Here, errors and omissions allowing, is the answer. The Angels are peripatic scholas, and the King David icons represent scholas who sing only at a particular church. The usual profile of these scholas can be summarised as follows. About half are composed of fewer than ten singers, sometimes as few as three; others have as many as 18 'regular' singers, though fewer would be present at a given Mass. The great majority sing the standard chant texts from the Liber Usualis, though a few use simplified versions as well. The chant tends to be sung by men only; about half also sing polyphony, which requires female voices as well. About a quarter of them sing (nearly) every week; the others sing as infrequently as once a quarter. The great majority are peripatetic, singing at a number of churches accross a diocese, though a few are attached to a specific church. About half of them have no official name - they are simply ad hoc groups of singers. Only two, out of the nearly twenty scholas I have identified, have a website: one is my own Oxford schola, and the other is the Rudgate Singers of York. Through these scholas it would seem that we are in touch with about 150 singers in total, although it is hard to gauge the degree of double counting (with the same singers being in more than one schola). What of professional groups? The cost of professional singers puts them out of reach of all but a very few churches. The Cantores Missae sing once a month at St Bede's, Clapham Park, and the Brompton Oratory and the Birmingham Oratory use use their own choirs for both forms of the Mass on a regular basis. Overall, this is not a situation in which the Chant can be said to be flourishing. What one can say is that it is being kept alive all over the country thanks to the superhuman efforts of unpaid enthusiasts with the opportunities afforded them by the Traditional Mass. We are determined both the help these existing scholas, encourage the formation of new ones, and also to raise the profile of Gregorian Chant in a more general way with training opportunities open to all. This year's pilgrimage to Chartres has been exceptionally hot. There was thunder last evening, as we approached the second campsite, but no rain. The heat has been maintained today. 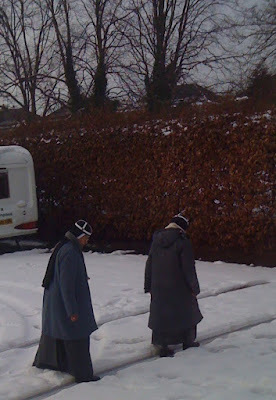 This makes it a lot harder for the pilgrims; after Mass on Sunday I started noticing groups of pilgrims waiting at the Order of Malta First Aid posts, clearly unable to walk further. 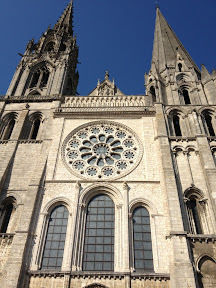 Somewhat to my surprise, I managed to walk the whole way, and somehow made it to our goal: Chartres Cathedral. 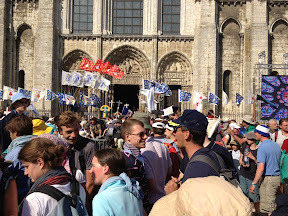 My group had watch Mass on a huge TV screen outside Chartres Cathedral: the Cathedral is too small for the pilgrimage! But is nevertheless of wonderful event, and a fitting conclusion to the Pilgrimage, and we were blessed by the Bishop of Chartres himself. I shall have a lot more to say, and a lot more photos, when I get back.